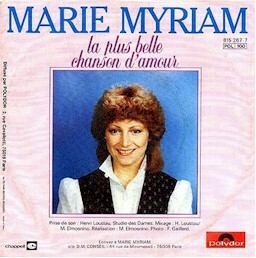 Marie Myriam (born Myriam Lopes, May 8, 1957) Belgian Congo, is a French female singer of Portuguese origins. Her first single "Ma Colombe" was released in 1976. "La plus belle chanson d'amour" is a cover version of the song: "I'll Find My Way Home"
Lyrics transcribed by Paulo Mouat and Henk Engelen.